Blogging has become very popular, and has become a 'hot' way of earning money online. But while so many people make a fortune at blogging, a lot of others get discouraged, and quit blogging. The major reason for this is, some people just don't know how to avoid some pitfalls that accompany the field. There's a lot more to blogging than just writing and earning money in return. 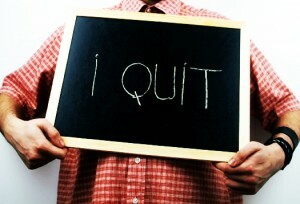 Take a look at the top 10 reasons people quit blogging, and learn to avoid those pitfalls. This is a trap everyone, even the pros should avoid. A lot of people get tangled in the web of their dreams about making large sums of money from their blogs. Now this either steals focus from the blog itself, or it induces bloggers to use every trick they can find on the internet to boost their revenue, and this includes stuff like black-hatting, spam back linking etc. Now you might get away with it for some time, but Google eventually will deliver the penalty, from which it is hard to recover. Hence, a lot of people quit in such circumstances. A lot of people also quit because of all the hard work required. Well, instead of thinking about earning money, they should think of their hard work as an investment. The more they put in, the more they'll get in return. But they also have to be patient. Blogging pays, but in due time. A lot of bloggers don't know about how to properly optimize their blogs for users as well as search engines. As a result, they get little to no traffic from search engines, at which point their website stalls. Hence, most get discouraged. Such people should learn about how to optimize their website. For better ranking. A lot of bloggers also underestimate the power of social media in building blog traffic. They don't use social channels properly. Some don't even share their content at all, whereas others excessively promote to the effect of spamming. Both groups should learn to properly make use of social media, or their progress might stall, which ultimately leads to rejection and quitting. This is a major problem these days. There is an acute lack of quality on a blot of blogs these days. The two most important ingredients in a blog are originality, and then quality. Lacking both means a visitor has little interest in that blog. This is mainly why a lot of blogs don't get traffic and readership, and hence it flops. One of the basic rules in blogging is to talk about hot stuff. It is one of the best ways to get traffic and engage readers. A lot of blogs fail because they don't discuss hot topics and latest news, and readers on that blog find the content outdated or monotonous. We have talked to our readers about this through various comments as well. We got complains from a few readers about covering latest news on Google. This is the answer to them right here. Latest news are a must for any blog. This is the same point as the above one, but from a competitors' stand-point. If you deliver news before your competitors, you will get the maximum effect of your hard work. But a lot of bloggers don't realize this, which is why most of the time, their posts go unnoticed. Readership is the most powerful thing a blog can have. If a blogger chooses to ignore his readership by not replying comments, or answering his readers' questions, they will ultimately leave his website. Hence, the traffic and engagement will drop, and the blog will go back to the stone age. In our post about the latest November 2012 PR update, we talked about how we give more value to Alexa that to PR, because Alexa is a more accurate indicator of readership and traffic. A lot of people keep their focus on PR, and backlinking and all that kind of stuff, but ignore the important part that is readership and traffic. As a blogger, you should set up monthly goals for your blog. For example, concentrate on one topic for a week or a month, and write about it on all aspects. This will develop your blog little by little on all fronts relevant to your niche. Another mistake people make is, they don't have a six-month, or a long-term strategy in mind. It is important to decide where you're going, and where you want to go. Creating a strategy is important, otherwise a blog will fail, and this is one of the many reasons people quit blogging after their blogs fail. THANKS ITS VERY INFORMATIVE. AGAIN A VERY GOOD POST BY MBT. Any blogger that want to profit from a blog must be veey enduring and alot of hardwork is needed at the initial stage but when things settles, you are made. i made a blog 8 months ago and continue posting articles but the traffic is suddenly down on 11 december 2012 (2500 to 300).